Spinach, commonly called ‘Palak', is one of the most popular green leafy vegetables of Southeast Asian Countries. For centuries, this dark green vegetable has been widely used as a source of food in Asia. It gained recognition when a celebrated cartoon character 'Popeye' used this green vegetable as a power boosting tonic. Spinach is used in variety of ways and is extremely popular in many parts of the world. Acknowledged for its versatility and nutrition, it is available round the year. A rich source of vitamins, minerals and other phytonutrients, this dark green leafy vegetable is regarded as one of the healthiest foods among all vegetables. Spinach has a high nutritional value and is extremely rich in antioxidants, especially when fresh, steamed, or quickly boiled. Though low in calories, it is a rich source of vitamin A (and especially high in lutein), vitamin C, vitamin E, vitamin K, magnesium, manganese, folate, iron, vitamin B2, calcium, potassium, vitamin B6, folic acid, copper, phosphorus, zinc, niacin, and selenium. Researchers have identified more than a dozen different flavonoid compounds in spinach that function as anti-inflammatory and anti-cancer agents. Intake of spinach has been associated with decreased risk of several blood vessel-related problems, including atherosclerosis and high blood pressure due to its high content of antioxidants. Spinach is also an excellent source of other bone-supportive nutrients including calcium and magnesium. Gastrointestinal health can be guarded by eating more of this food, as the antioxidants beta -carotene and vitamin C present in high amounts in spinach work to protect the cells of the body's colon from the harmful effects of free radicals. Studies have shown that consumption of green leafy vegetables such as spinach may slow the age-related decline in brain function. Lutein, a carotenoid found in spinach is protective against eye diseases such as age-related cataracts and macular degeneration. 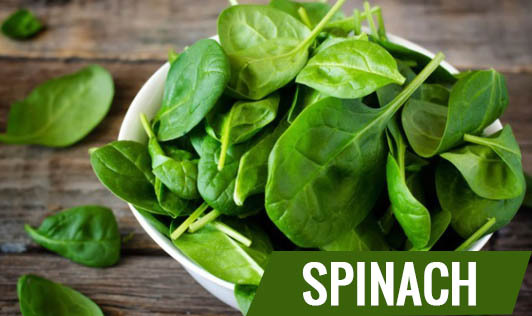 Being an excellent source of iron, spinach helps in combating iron deficiency anemia when had with a balanced diet with other iron rich foods. Fact:In order to build more muscles one should have a healthy diet that is high in protein and also exercise well. Spinach is a very healthy food but is not a good source of protein and does not directly help in muscle building. Myth: Eating spinach in pregnancy and lactation will lead to cold. Fact:It is myth that including spinach and greens in the diet with lead to cold in pregnant and lactating women. Spinach is a good source of many essential nutrients like iron, calcium, etc. which are very important in pregnancy and lactation. It is also rich in vitamin C and other antioxidants which helps in tackling cold and improves immunity. All women should include spinach with other greens in these phases of life. Tender, fresh spinach is delicious in salads, pasta, soups and dips and is an easy, healthy addition to many meals. Plus it is versatile-spinach is equally tasty raw or cooked. Spinach can be added in salads, raw, stir fried steamed or cooked to give it a good taste. You can make healthy side dishes with spinach like plain palak, alu palak, dal palak and the most famous palak paneer. A healthy, delicious soup with a bright green color can be made of spinach. Puree of cooked spinach can be kneading along with wheat flour to give healthy palak roti. If you have kids who do not like spinach, make a paste of it and add it to rotis, idli batter, dosa batter to give the items a nice green color which is attractive. It can be added to pulao instead or along with other vegetables to give you a palak pulao. Spinach can be included in the stuffing for sandwiches, parathas or also added in cutlets.